MONTRÉAL — Choosing to stand and hold the microphone in his hand during his post-match press conference to avoid any further cramping, Denis Shapovalov, less than an hour after unquestionably earning the landmark victory of his tennis career, was asked how he was feeling after spending two hours and 46 minutes exchanging groundstrokes in anger with Rafael Nadal – and beating him. He could have said elated, as he surely was. He could have said shocked, which he definitely was. Instead, he admitted that he was…ready for bed. You would want to go to sleep as soon as possible, too, knowing your upcoming dream will actually be about the realization of the hundreds of dreams imagined before it. One cannot come close to being hyperbolic in attempting to put into context Shapolavov’s triumph over the world’s No. 1 men’s singles player, 15-time Grand Slam champion Nadal, in the cool Montréal evening on Thursday. 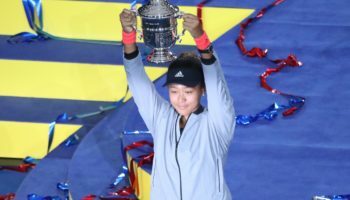 Let us count the ways in what makes this win one of the more historic victories by an unseeded player in any tournament in the sport’s recent history. At 18 years and three months, Shapovalov is now the youngest-ever quarterfinalist in ATP Masters 1000 history (since 1990). 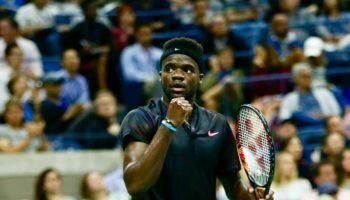 He also is the youngest Rogers Cup quarterfinalist since 1974, when a young Swede named Bjorn Borg made the last eight at 18 years and two months. How did that Borg guy turn out afterward? Furthermore, Shapovalov is the youngest player to beat a Top Two opponent in a completed match since Nadal, at 17 years old, defeated then world No. 1 Roger Federer in the third round of the ATP Masters 1000 in Miami. How did that Nadal guy turn out afterward? That is the class Shapovalov just joined tonight. It was his punishing inside-out forehand that was his biggest weapon in his arsenal (49 winners overall, 33 on the forehand), yet the partisan, deafening crowd noise from his fellow Canadians – turning the atmosphere to that you might witness before the start of a Montréal Canadiens home playoff game – might have been the most devastating weapon. One of those supporters in the stands happened to be none other than hockey legend Wayne Gretzky. Undoubtedly the country’s best-ever sportsman, Gretzky, who is friends with Shapovalov’s manager, got to see one of Canada’s biggest-ever wins in the sport of tennis. In the process, the Great One also got to see some great escapes from Shapovalov tonight, especially in the beginning of the third set. After winning the second set, 6-4, Shapovalov was under pressure on his serve time and again, only to pull himself out of the fire each time. Nadal held at least one break point on each of Shapovalov’s first three service games, and had six of them combined during that stretch. All of them were erased by Shapovalov, who also wiped out a 3-0 deficit in the final set tiebreak, winning seven of the last eight points of the match. As monumental as the win is for Shapovalov personally, it may also actually serve as a seminal moment for the Tennis Canada program. All this week at Coupe Rogers, the 10-year anniversary of the launch of the National Tennis Centre, located on the grounds of this tournament, has been celebrated. 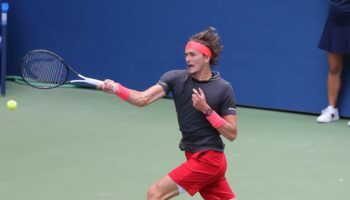 Before 2007, there was no central training hub for up-and-coming tennis players in the country, as those players, if they chose to stay in Canada during their formative years in tennis, primarily worked with their own coaches and remained with their tennis clubs in the provinces they resided. Shapovalov spent most of his development just north of Toronto being coached by his mom, Tessa, and personal coach Adriano Fuorivia, who still consults him. It was only at the beginning of this year that Shapovalov decided to continue his development here in Montréal. Milos Raonic and Eugenie Bouchard, the country’s two biggest current hopes for tennis glory, developed their games here in Montréal during their final years as juniors, and have both reached the final of a Grand Slam. 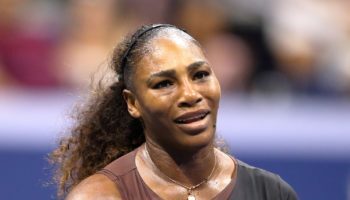 Both have also experienced struggles on tour recently, particularly in the showpiece tennis event that takes place on Canadian soil, with both being eliminated from the tournament this year in their first match. (Bouchard’s match in the Rogers Cup took place in Toronto.) Shapovalov’s win is already being compared to, arguably, the biggest singles win ever by any Canadian player. 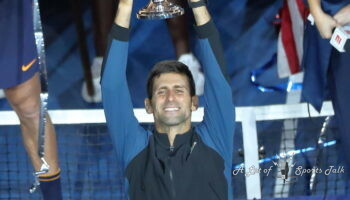 That is when then 19-year-old Daniel Nestor – ranked No. 239 in the world – shocked world No. 1 Stefan Edberg in five sets during a 1992 Davis Cup tie between Canada and Sweden in Vancouver. 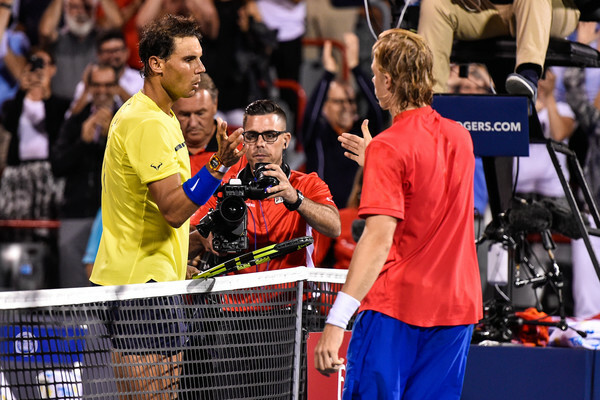 Shapovalov, during the on-court interview with TVA Sports, mentioned that Nadal was his idol growing up while acknowledging that he could not have pulled out the victory without the crowd support. He got the chance to play his idol, though the fairytale surely was put on hold when he actually felt the weight of every shot coming from the other side of the net. Shapovalov not only matched Nadal’s competitive fight, but outshone him in the biggest moments of the match. That dream became reality, but a dream finish in Montréal is not over just yet. Let him get to bed as soon as possible and see if he can make that dream come true as well.